What Are Gable Boxes And Their Most Usage? Gable boxes are the versatile packaging boxes in modern world. Giving the benefits of a bag and a box, gable boxes can be used as food packaging boxes, gift boxes and many more. Making a name among top packaging boxes, gable boxes are eye-catching, solid, and profitable for business. Versatility – Equipped with handle, gable boxes provide the benefits of a bag and box. Usage – Gable boxes can be used for packaging boxes for food items in delis, restaurants, and take-aways as well as packaging of gift items. Size: – Design of gable boxes is adoptable to every size to accommodate any shaped or sized items. Material – Most gable boxes are made with white or brown kraft but they can also be made with other material like cardboard too. Printing – Gable boxes can be printed using CMYK or PMS. Packaging – Gable boxes come in flat pack to consume less space when stored and can be easily assembled. Why Gable Boxes By My Box Printing Are More Profitable? 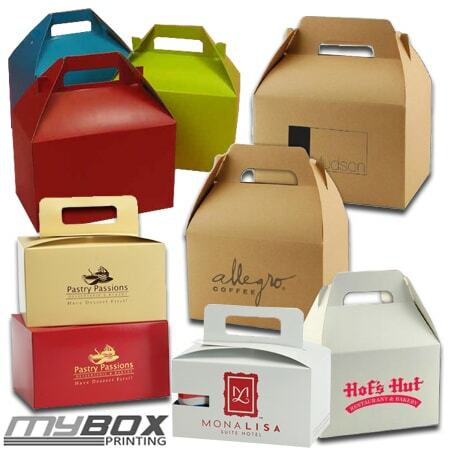 My Box Printing is the leading manufacturer of custom printed gable boxes in UK. Our custom printed gable boxes are made with highest quality biodegradable material and can be used for many purposes. Having a cost much more less than the market is another good thing of our gable boxes. If you want to place an order for your next batch of custom gable boxes, contact our sales department to request a quote. And our sales department will reply you with an unbeatable price. Home » Blog » What Are Gable Boxes And Their Most Usage?